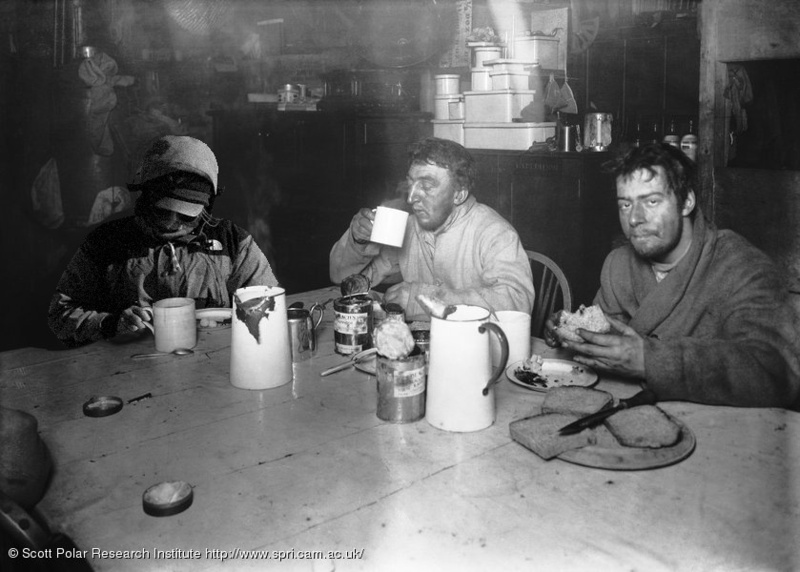 Alpine filling out his daily diary with Birdie and Cherry after the “Worst Journey in the World”, circa 1911. Yes, it’s photoshopped. No person who has not spent a period of his life in those ‘stark and sullen solitudes that sentinel the Pole’ will understand fully what trees and flowers, sun-flecked turf and running streams mean to the soul of a man. The numerous people who imagine that a long stay in the Polar regions makes a man less susceptible of cold than other mortals are completely mistaken. Well, our time in the field is coming to an end soon and it’s of course bittersweet, as folks are starting to look forward to seeing friends and families again, but also understand what a very special privilege and experience this has been. I know I’m still not quite ready to leave, as I’ve met some great folks and have participated in an amazing event. Naturally, a lot of the activities with which I’ve been involved are related to the planetary sciences, but I’ve also been involved in research related to the life sciences – that is, the human factor. Some of us volunteered to participate in a research project that is investigating how people work and live in extreme / remote environments. This research is being led by a team at Michigan State University, and the goal is to better understand how teams in extreme environments work together most effectively and what stressors can influence both individuals and the team as a whole. The research requires those of us who volunteered to fill out a daily journal, which is composed of very specific statements to which we have to provide very specific responses (agree, disagree, or remain neutral), but are also given the opportunity to write longer responses to some more general questions. Individual factors, such as sleep patterns, health and psychological difficulties are examined, as well as team factors such as team cohesiveness, conflict and performance & completion of tasks. Team leadership is also examined. Note from rph: The research project Ringo mentions is run by Prof. Steve Kozlowski’s group at MSU, where they are supported by NASA to study team dynamics in isolated and challenging environments. Unfounded rumors of our effectiveness (smirk) prompted Steve to contact us about a decade ago, after which we worked with them to develop a data collection method that could be integrated into our expeditions without posing an undue burden. The result (with some tweaks along the way) is the daily diaries mentioned above, where a minimal entry can take less than a minute. Participation has been pretty good, but strictly voluntary; many ANSMET folks enjoy an excuse to do a little self-analysis of their day while others (and I quote) “……don’t want anyone looking inside my head”. The diaries are delivered to MSU after the season and ruthlessly anonymized; the data is about how the team works together, the role team leadership and communication plays in effectiveness and personal comfort, and how all these things evolve from before the season starts to after it ends. The anonymized results have been routinely shared with ANSMET team members (both leadership and volunteers), and have resulted in a couple of publications and presentations. If any of you are interested in seeing a synopsis of that work posted here, let me now. I’m sure Steve and I could put together a little summary for you when this season’s work is done . Oh, and as to that Roald Amundsen quote. So true. Every winter I’m home the “This must seem like summer to you….” comment rises ad nauseam with every cold spell. Truth is I’m the first to put on a jacket, first to put up my hood, first to say “let’s stay home and light a fire”. ANSMET teaches you to respect the cold, not to ignore it.